As you will know pearls come in a wide variety of different sizes. However, we offer you Lavender Freshwater pearls that measure between 6mm and 8mm in diameter. These are, in fact, the most popular size of pearls that jewelers like to use when creating a pearl set. The main reason we’ve chosen such size pearls to include our Lavender Freshwater pearl sets is that they are more versatile. These pearls will suit women of all ages and look wonderful when worn with a variety of different outfits. We have made sure that we offer different necklace lengths within our collection of Lavender Freshwater pearl sets. We do this because we understand that not every length will suit every woman. For shorter, petite women then they should look at wearing a shorter necklace. Ideally, they should look for one in our collection that will sit just below their collarbone or throat. For taller, fuller women they will find that wearing a longer length necklace is a better option. This will help to draw people’s attention down toward the bottom of the necklace. When it comes to you deciding what type of pearl set to buy this can prove quite difficult as there are certain things that must be taken into consideration first. Ideally, the set you choose should suit yours or the recipient of such a wonderful gift personality. Plus you need to take into consideration the kinds of occasions when you or the other person are likely to wear their Lavender Freshwater pearl set on. Below we take a look at the four main types of pearl sets you can buy today as well as the kind of occasions when they can be worn. Many people love the simplicity of this type of set, as it comprises a necklace, earrings, and bracelet that are made up of pearls of the same color. 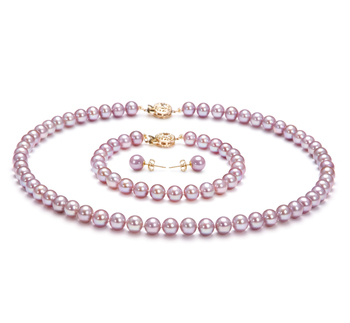 It is possible to wear a single Lavender Freshwater pearl set with either casual attire or more formal attire, as it is so very versatile. Very similar to the single pearl set but of course with the added sparkle of diamonds or cubic zirconia gemstones in the design. Such will add an additional touch of refinement to many outfits in a woman’s wardrobe. It is possible to wear one of our Lavender Freshwater pearl sets with a suit when going to work or with a lovely little formal dress when going to a high-class soiree. This is the most classic set of pearls most women tend to like to wear and they continue to have an ageless beauty to them. A mono-stranded Lavender pearl set really helps to bring out a woman’s femininity, even more, when worn. Such sets are made up o a mono-stranded necklace along with a bracelet and set of single pearl earrings. You will find that this is the most elegant one in our collection of Lavender Freshwater pearl sets. Like all others, it is made up of a necklace, earrings, and a bracelet and is ideal for wearing to a formal party. Any woman who chooses to wear a double-stranded Lavender Freshwater pearl set will look effortlessly elegant and poised. We hope that with the information provided above you now have a better idea of just what kind of Lavender Freshwater pearl set you should consider buying. So why not take a careful look at the sets we have available in our collection, we are sure you will find one that doesn’t only just suit your tastes and personality, but will also fit into your budget. Each set is carefully crafted to ensure that you have something beautiful to wear for many years to come.